Jackal and lion looking at each other after the jackal realized that a lion was in its path. That omnipotence paradox can be applied to animal fights between equals in the wild (e.g., a territorial fight). However, when unequals face each other, the more powerful force is always unstoppable or immovable for the weaklings. There are a series culverts near the Nebrownii waterhole which lions use as makeshift dens. The day’s end was near which meant the flow of vehicular traffic had slowed down to a trickle, and that was signal for the lions to come out and bask in the cool afternoon zephyr. Three adult female lions were already on the road beside their culvert that day. One of the lions looked at my car pulling to a stop, and with complete disdain walked right to the middle of the wide road and flopped down. It was so uninterested with my car that it even faced away from me as it flopped down. As I sat looking at the two other lions, I saw a jackal walking towards us and the lions. It seemed completely oblivious to the presence of the lions. Jackals can get killed for wandering too close to lions, and this one was definitely in danger of becoming another casualty. I couldn’t see the lion’s face (obviously! ), but I’m sure it was watching the jackal. Cats, unlike any other group of animals, seem to observe and notice everything within the realm of their senses with intense curiosity. As the jackal kept walking closer in abject ignorance, the lion made its move. A flick of its tail and a raised head showed that the lion was now curious, perhaps to take a closer look at what that silly jackal was up to. The lion’s actions were instantly registered in the jackal’s mind and it stopped. There was a look of surprise, but perhaps a little bit of contemplation and fear as well. An immovable object was in the jackal’s path, and the it was no unstoppable force. 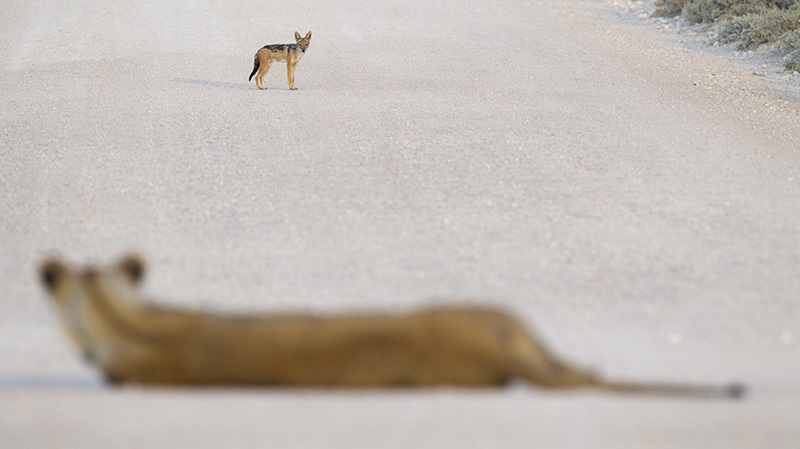 A few uneasy seconds followed, and the jackal wisely turned away and began walking in a different trajectory. Wise decision. And as the light was fading quickly I had to do what the jackal did, and turn around to get back to camp.